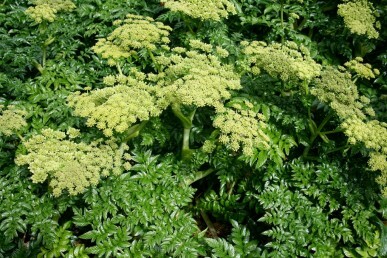 Statuesque angelica (Angelica archangelica) is a native of North and Eastern Europe to central Asia and Greenland. I love its large fresh green leaves that add a tropical lushness to my garden and it’s huge soccer ball sized, lime green flower heads. It is a fast growing biennial herb to more than 2 m when it flowers. In the first year angelica grows as a large clump with hollow, ribbed stems that are produced from a strong taproot and large soft matt green leaves. In spring of the second year, a hollow stem grows from the centre of the plant; this is topped by one or more large rounded flower heads, the flowers are followed by ribbed seeds. Glossy angelica (Angelica pachycarpa) has glossy leaves, is smaller growing and is a useful ornamental plant. 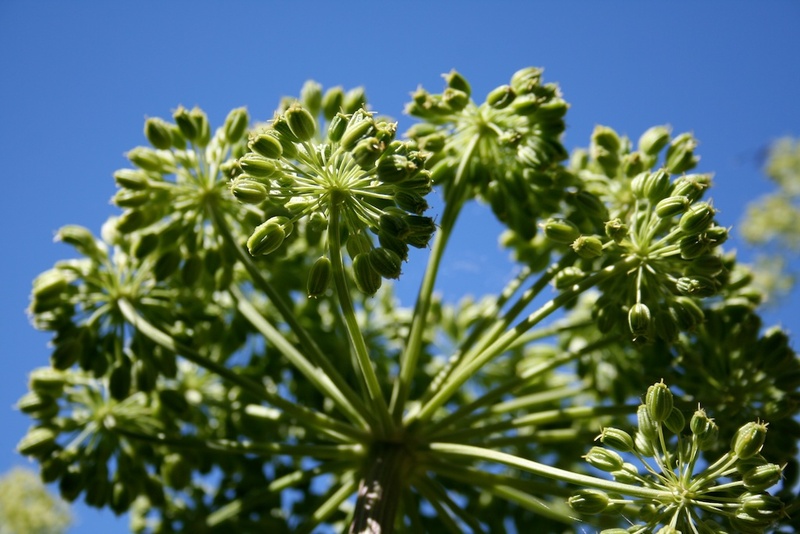 In the past angelica was used as a potent protector against disease and evil spirits. In the seventeenth century it was an essential ingredient in Charles II’s ‘King’s Majesty’s Excellent Recipe for the Plague’. It was included in Carmelite water, a mixture taken by the well-to-do to promote long life and protect against poisons, enchantments and witches’ spells. 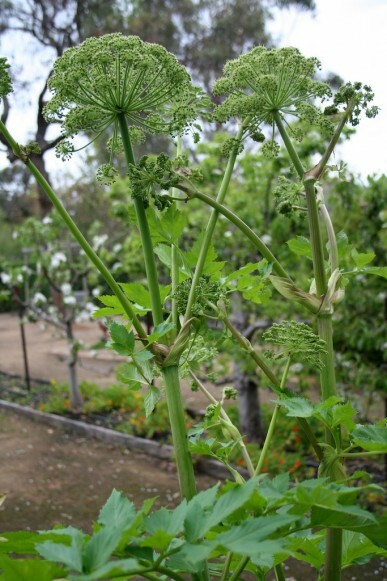 Angelica is always grown from seed, but the seed must be fresh. Anything over twelve months old and germination will be very patchy. Leave the seeds on the surface of the soil because they need light to germinate, just tamp them gently into the ground. Sow seed in autumn in cold regions. If you live in a warmer region, or just have trouble getting the seed to germinate, then try chilling the seed to aid germination. Wet the seed and wrap in damp paper towel, place in a plastic bag in the refrigerator for 2-3 months, then sow outside in spring. This plant is not suitable for the tropics. Angelica is a large plant, so space seedlings about 1 m apart in any reasonable humus-rich soil, in a partly shaded position. Morning sun and afternoon shade is best. 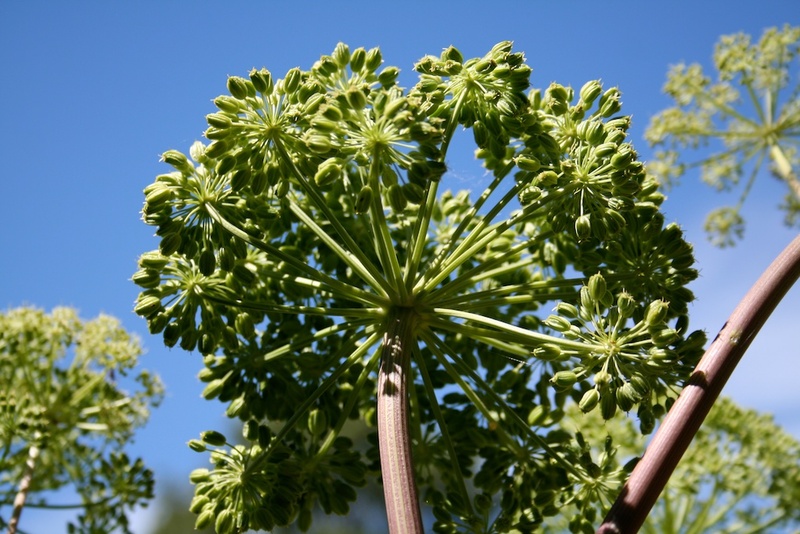 Angelica self-sows readily in cooler regions so once you have grown one plant, you will have lots of seedlings coming up the following year. Pick leaves and stems at any time but they are best before the plant begins to flower. Harvest seed once they start to turn brown, place the whole flower head in a paper bag so the seed can finish maturing. 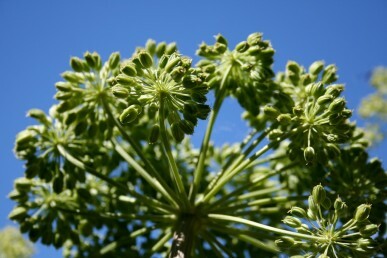 I love the scent of angelica, the whole plant is sweet and aromatic with a flavour somewhere between musk and juniper. 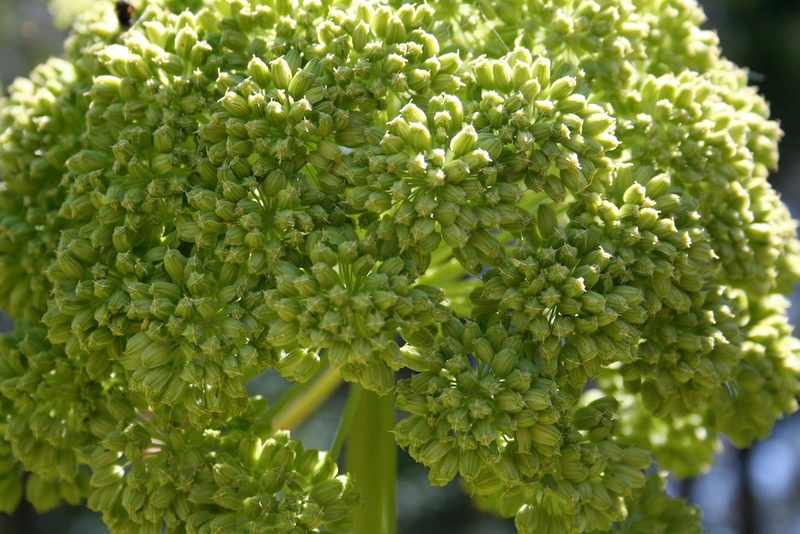 Leaves, stems and seeds are all used in cooking, the stems crystallized and the oil in flavouring, especially alcoholic drinks like chatreuse and vermouth. Young stems are cooked like asparagus and eaten, added to sauces for pork or fish dishes, or combined with rhubarb to alleviate tartness. They also combine well with citrus when making marmalade. I always add a handful of chopped stems for every kilo of fruit. Medicinally, leaves and seeds are made into a tea to reduce the symptoms of a cold and catarrh, to calm the nerves, to reduce the pain of arthritis, to ease indigestion and improve appetite and increase circulation, especially to the hands and feet. Chew stems to relieve indigestion and flatulence and take a bunch of the leaves on a long car trip as the scent will reduce the chance of car sickness. Don’t take medicinal doses of this plant if you are pregnant or diabetic, and as with all herbal remedies, don’t take too often or for too long. When in flower, angelica is a magnet for beneficial insects with bees (both native and honey) as well as predatory wasps, tachnid flies and hoverflies feeding on the nectar. Leaves, chopped stems and seeds will retain their colour and add fragrance to pot pourri if they are slowly dried in the dark at moderate temperatures.